Nigel Adkins believes it is only a matter of time before Billy Sharp ends his barren run in front of goal. 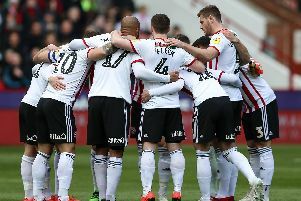 The Sheffield United centre-forward, who worked with Adkins at Scunthorpe, Southampton and Reading before returning to Bramall Lane earlier this year, enters tomorrow’s match against Walsall having failed to score for four games. But Adkins, who yesterday allowed defender Terry Kennedy to join Cambridge United on loan, said: “I know, at this level, Billy is going to get chances and that he’s going to put them away. The big thing is believing in him and I certainly do. Sharp, aged 29, has hit the target seven times in 19 appearances since leaving Leeds in July.